There are certain design elements and motifs that have resonance for all humans across the globe. Often they are created by nature, and then repeated or distilled into patterns by artists. They can be mixed up and used in a variety of forms which we find mesmerizing. One such element is the humble “dot.” The dot is such a simple element, but it has universal appeal. Dots are everywhere! The rocks in a river appear as colored dots. Animals wear dots. We decorate our walls and clothes with dots. Flowers attract pollinators with dots. Some of us have dots on our faces. We make language with dots and cover our toilet paper with dots. Even our digital “Dot Com” world is literally dots—TV, computer, and printed images are all made up of dots. 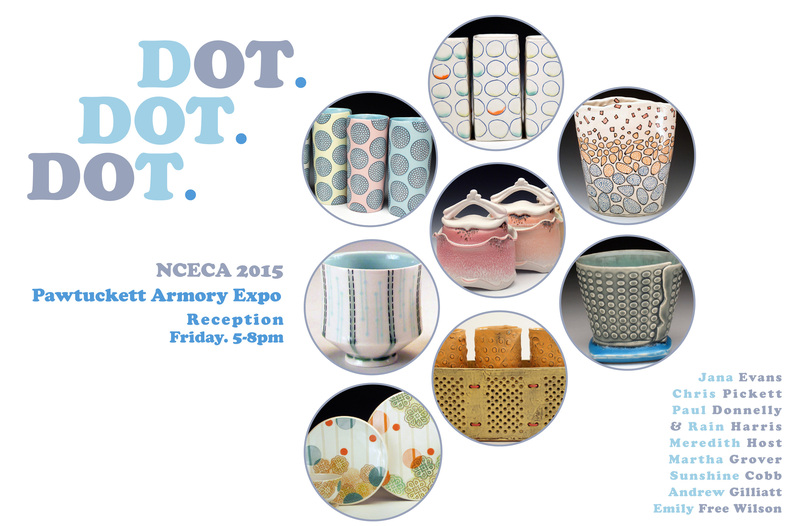 The concept for this show is to bring together nine artists who all use dots in their work and to examine the many reasons and ways in which a simple dot can be incorporated in pottery—surface drawing, glaze design, glaze resist, carving, relief, piercing, etc. Patterns of dots can express nature, movement, humor, culture, or concealment—universal topics that connect with all audiences. Some of the artists look to the natural world and mirror its use of dots, others gravitate towards the manmade world and industrially produced dot patterns. Others still use the dot as form and negative space rather than surface decoration. Each individual artist takes this very simple element and uses it to express many ideas. I chose each of the artists for this show because of the varied way that they incorporate dots into their work. Andrew Gilliatt’s slipcast pots use patterns of glaze dots layered with custom decals that use dots to represent natural forms, like sunflowers, or dots of varying sizes to make optical illusions on the surface of his pieces. Chris Pickett reduces flowers into geometric forms, stripping away their nature to leave dots and lines that are raised on the surface of his hollow slab built forms. Emily Free Wilson decorates the surface of her pinched vessels with lines and dots making lush landscapes of patterns within patterns. Jana Evans inlays underglaze into the surface of her wheel thrown pots making intense dot patterns that draw the eye closer to the piece. In my work, I embellish the edges of my pots with dots that replicate the dappled patterns of orchid petals which attract insects deep into the inner folds of the flower. Meredith Host obsesses over the dot patterns that abound and are overlooked in our built environment finding inspiration in the surface of toilet paper and paper towels, which she then extrapolates into mesmerizing surfaces on her functional wares. Paul Donnelly and Rain Harris have just begun to make a series of collaborative pots that utilize Rain’s cascading dot surface design and Paul’s tight throwing skills to create fascinating utilitarian wares. Sunshine Cobb uses dots to pierce through the surface of her baskets, revealing and concealing the contents within.